Earth & Turf Products, LLC, recommends its 100SP Self-Propelled, Walking Topdresser for those jobs that demand capacity where maneuverability is important. The 100SP has a struck-level capacity of 10 cu. ft. to permit fewer loads per job. It is powered by a 10.5-hp Briggs & Stratton engine. 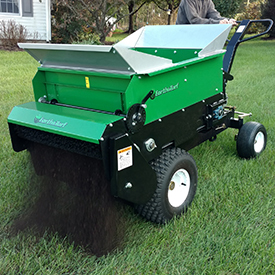 A four-wheel stance increases stability on more hilly lawns, and hydrostatic drive makes this topdresser very user friendly. Other beneficial features of the 100SP include turf tires for minimum compaction, easy drive engagement for convenience and a 35-1/2-in. overall width for narrow access paths. Smooth, even spread is insured with the use of a 30-in. brush expeller.